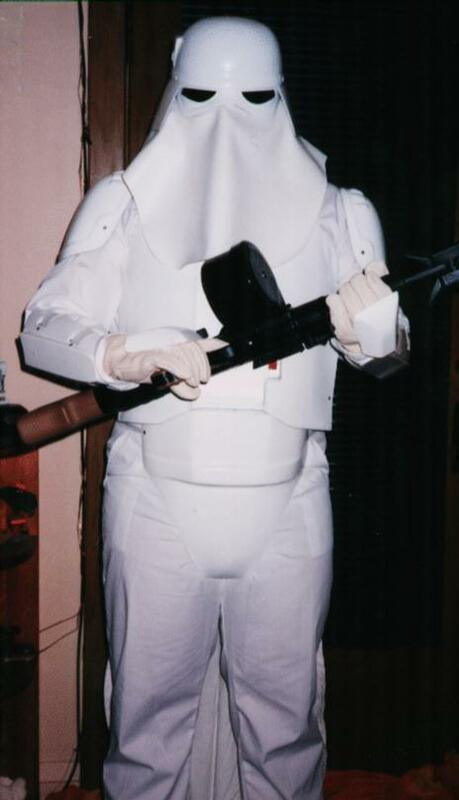 Hoth Stormtrooper Outfit (front): The Snowtrooper helmet is a heavy plastic resin with an oil-style cloth glued inside. The cloth is thick so gives that heavy appearance seen in TESB. The eye-slots are small, but surprisingly easy to see through. It is a very warm helmet, and likely could be worn in winter! The body armor is made up of nine pieces all made of the same heavy (very heavy!) material as the main helmet: one full size chest piece, one full size back piece with detail backpack, two shoulder bells, two arm guards, two hand guards, and codpiece. All of them are attached using an industrial velcro and straps. The backpack, straps, and velcro are also bolted to the armor. The cape is velcroed to the back of the bottom of the back piece and extends to nearly the ground. The suit is a simple white worksuit while the gloves are oil work gloves. The MG34 Heavy Blaster is from Marco Enterprises. This is a big outfit, as I stand 6'1" and am heavyset, and this fits just right!